B-Air® is proud to introduce the Kodiak KP-0.5 to the line of high-quality industrial grade inflatable blowers. The Kodiak KP-0.5 advances in all realms of efficiency – a revolutionary compact design that is lighter than any other industrial grade inflatable blower in its class. B-Air® is proud to introduce the Kodiak KP-0.5 to the line of high-quality industrial grade inflatable blowers. The Kodiak KP-0.5 advances in all realms of efficiency – a revolutionary compact design that is lighter than any other industrial grade inflatable blower in its class. Weighing a mere 26 lbs, the Kodiak KP-0.5 delivers a powerful 750 CFM, produces 5.6 inches of static pressure, all the while requiring only 3.2 amps to operate. In traditional Kodiak fashion, the KP-0.5 is housed in a high impact, roto-molded housing, comes standard with safety designed reverse air louvers and is stackable to save on storage space. The 2+ HP Kodiak blower (#KP-2+) is the latest high-efficiency B-Air designed blower for commercial* use. The Kodiak produces unparallel 1520 CFM with 10.8″of static pressure ensuring proper inflation of larger and older commercial* Inflatables. 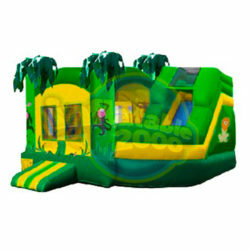 The most powerful yet, the KP-2+ will inflate any large inflatable play structure. We are proud to offer the Super Kodiak Power Model # KP-2+ as the ultimate in 2+ HP blowers.